'Slash' doesn't yet own a finished copy of Chinese Democracy, but he's heard "bits and bobs here and there" - and he's unimpressed. "I just don't think the quality is there," he says. "The songs aren't up to the usual Guns N' Roses standards." It should be stressed that this 'Slash' isn't Saul Hudson, the top hat-wearing guitarist who made history with Axl Rose in the original Guns N' Roses. 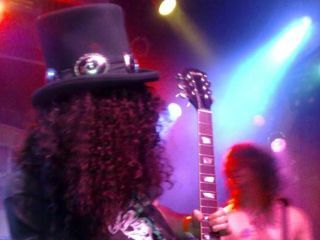 This is Alan Gordon, who portrays Slash in the tribute band UK Guns N' Roses. "We're the biggest Guns N' Roses tribute band in Britain, and probably all of Europe," says Gordon, who also manages the group. The UK Guns N' Roses "stick to the good stuff," says Gordon. The six-member band (which also includes an Axl, Izzy, Duff, Matt and Dizzy) play the Guns catalog from Appetite For Destruction through the Use Your Illusion albums. "Those are the records that have the songs our fans want to hear," says Gordon. "Also, we're talking about a period of time when you had the ultimate GN'R lineup." As such, Gordon doesn't expect to be adding songs from Chinese Democracy into the UK Guns N' Roses set. "They just wouldn't fit," he says. "Axl's gone off in this other direction that wouldn't work with a true Guns N' Roses show. Plus, our fans haven't expressed any interest in the new stuff. They like the hits, and we deliver 'em better than anybody." But what happens should Gordon buy a copy of Chinese Democracy and decide he likes it? Would the guitarist reverse his decision and add new songs to the set? "Based on what I've heard, that's not likely to happen," he says. "Still, I'm driven by our fans. If they come to me and say, 'We want this new song, we want that new song,' then we'd have to give it some thought. "I can't see that happening either. Our fans love the classic songs and the classic lineup. Adding industrial songs and putting on a bucket to become Buckethead, or having somebody be a Bumblefoot, that would be awfully strange." The UK Guns N' Roses are eager to tour the US next year. Interested promoters should contact the band at http://www.ukgunsnroses.com/. Read MusicRadar's review of Chinese Democracy.